LOS ANGELES (Reuters) - Pop singer Justin Timberlake scored his second chart-topping album this year on Wednesday as his latest record debuted at No. 1 on the weekly Billboard 200 album chart, capping the singer's successful return to the musical spotlight. Timberlake's "The 20/20 Experience - 2 of 2," which follows the first set of 10 songs released in March this year, sold 350,000 copies in its first week, according to figures compiled by Nielsen SoundScan. The first installment of "The 20/20 Experience" sold 968,000 copies, the biggest opening week sales of the year so far. 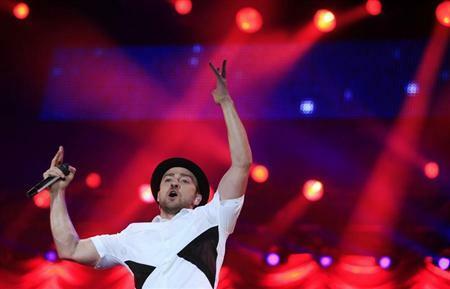 Timberlake, 32, returned to music after more than a five-year hiatus, during which he focused on his acting career. His debut single "Suit & Tie" featuring rapper Jay Z became a chart-topper in January, and his album was received well by fans and critics. Other new albums in the top 10 this week include 16-year-old New Zealand singer-songwriter Lorde at No. 3 with her debut album "Pure Heroine," selling 129,000 copies. The album has been driven by the popularity of the single "Royals," which topped Billboard's digital songs chart this week, selling more than 2 million download copies in the United States. Lorde's album also garnered nearly 6 million U.S. plays on online streaming platform Spotify in its first week. Country singer Tyler Farr entered the chart at No. 5 with his debut album "Redneck Crazy," while Los Angeles sister trio Haim came in at No. 6 with the critically acclaimed debut album "Days Are Gone." On the digital songs chart, which measures song downloads, the top three songs remained steady this week with Lorde's "Royals" at No. 1, Katy Perry's "Roar" at No. 2 and Miley Cyrus' "Wrecking Ball" at No. 3. A surprise entry on the digital songs chart this week came in the form of British 1960s rock band Badfinger's "Baby Blue" at No. 32. The song scored 37,000 downloads in the past week after being featured in the closing scene in the final episode of AMC's drug drama "Breaking Bad" last month. Overall, album sales for the week ending October 6 totaled 4.8 million, down 10 percent from the comparable week in 2012, according to Billboard.